The capital of Vietnam and the second largest city in the nation, Hanoi is the jumping off point for many adventures in Northern Vietnam. 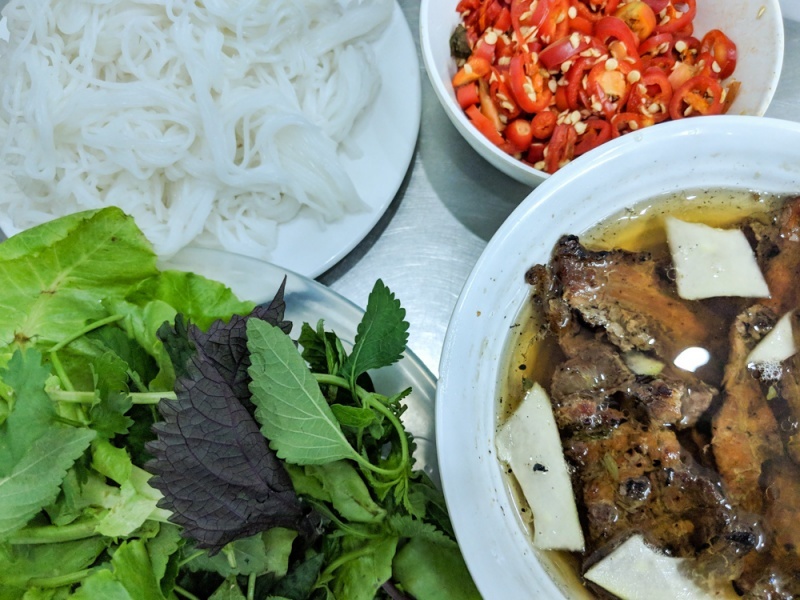 And while we would most certainly argue that you should get out of the city and into the countryside, you’d be doing yourself a disservice not to explore the many amazing things that Hanoi has to offer. 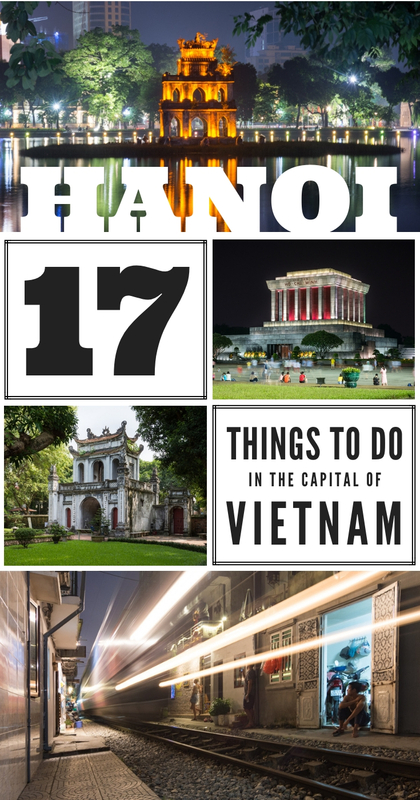 Check out our list of 17 things you shouldn’t miss while visiting the amazing city of Hanoi! The currency in Vietnam is the Dong (VND). At the time of writing (August of 2018), the conversation rate was about 23,305 VND to $1 USD. So if we say that something costs 50,000 VND, that’s just about $2 USD. The easiest way to get around Hanoi is by taking Grab cars or motorbikes. It’s like the Uber of SE Asia. Download the app and either add your credit card details or opt to pay cash for each ride. Grab motorbike drivers wear green jackets and will have a helmet available for you to use. Learn a few phrases to get around! “Xin chào” (pronounced “sin jow”) means “hello” and “cảm ơn” (pronounced “kam on”) is “thank you”. You should not assume that Vietnamese people speak English, more often than not they don’t. Pick up a Vietnamese phrase book to help you get around. O’Gallery Premier Hotel & Spa is a stunning beautiful hotel in Hanoi. Centrally located in the Hoan Kiem district, it is close to the St. Joseph Cathedral and the Ngoc Son Temple. The staff at O’Gallery are so friendly and are happy to help with your every need. The rooms are huge with beautiful decor and luxuriously soft beds! You’ll love the spectacular rooftop pool at The Lapis Hotel that is perfect for escaping the midday heat of Hanoi! The gym is ideal for keeping up your fitness while on vacation, especially after you enjoy the delicious breakfast at The Lapis. Rooms are large with an old school charm. If you want to truly pamper yourself during your vacation in Hanoi, consider booking a room at the Sofitel Legend Metropole Hanoi. Not only is it a spectacular neoclassical luxury hotel, it is also a historic landmark since 1901. This 5-star hotel is the ultimate in glamour and class and you’ll love the swanky bars, the gorgeous outdoor gardens, and the friendliest staff! 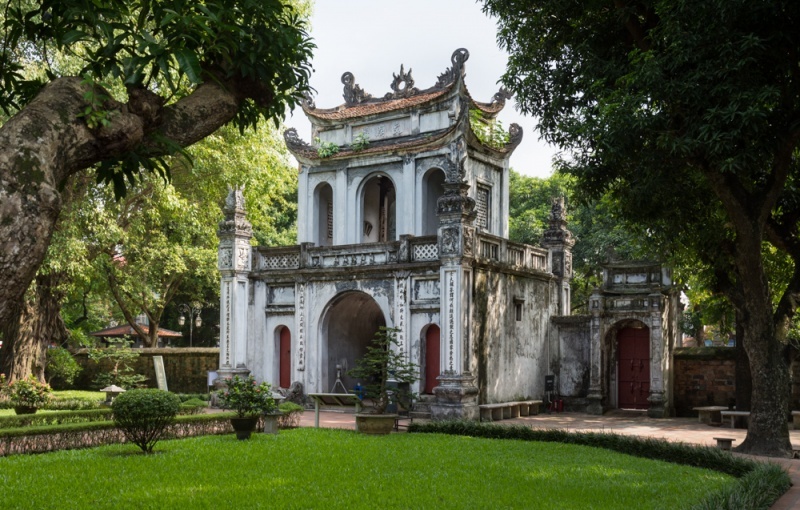 The Temple of Literature is a gorgeous, picturesque site surrounded by well-maintained gardens. It is truly a little piece of tranquil paradise located in the heart of bustling Hanoi. Construction began in 1070 and it opened as a university in 1076. It originally only accepted aristocrats and the elite but later opened its doors to other bright “commoners”. Students learned the Chinese language, philosophy, and history as well as other genres of literature and poetry. The temple has been well preserved through the chaos of Vietnamese history. Housed inside the courtyards are carved stone turtle steles that are engraved with the names and birthplaces of 1,307 successful student graduates. These massive stones were enclosed in walls and that were filled with sand in order to keep them safe through the bombings of the Vietnam War. It is miraculous that they survived and are in such pristine condition today. You’ll want to take your time when you visit the Temple of Literature. Wander through the five courtyards and stop to appreciate the peaceful lakes filled with lily pads and the Well of Heavenly Clarity. There are several gift shops inside selling Chinese-influenced souvenirs in case you want to do a little shopping during your visit. Traveling with the family? The Temple of Literature is also a fun activity for a trip to Vietnam with kids. The Hỏa Lò Prison was originally used by French Colonists to house political prisoners and later to house US POWs during the Vietnam War, including Senator John McCain. Built in the late 1800’s, the name Hỏa Lò was a nickname given to the prison by the Vietnamese people and translates to “fiery furnace”. The reason for that nickname was both for the wood stove shops common in the surrounding neighborhood as well as for the horrible treatment of the prisoners housed inside. The prison once held anywhere from a few hundred to 2,000 prisoners and is a dark and depressing museum to visit. You’ll see the tiny rooms where Vietnamese prisoners where shackled in solitary confinement and the French guillotine used for beheading people (including a few terrifying images of the heads on display in woven baskets). Conditions were abysmal and you’ll feel a deep sorrow for the people who were confined to this place. 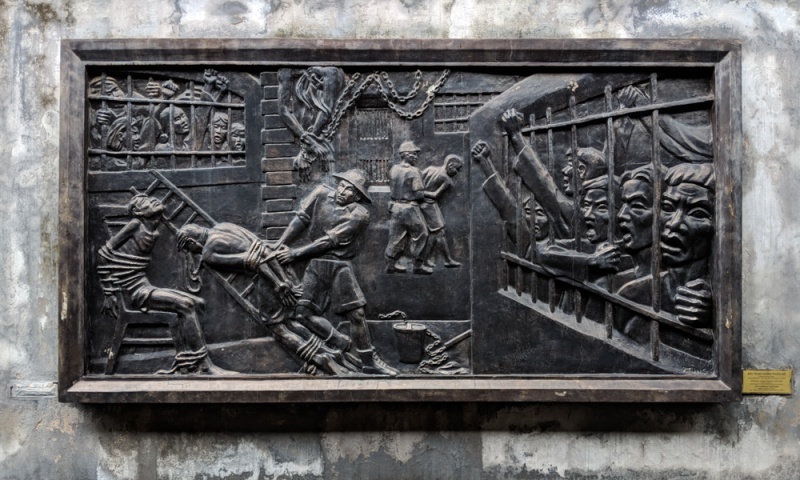 The prison museum paints a bleak picture of the treatment of Vietnamese prisoners and ends with an intriguing display of the US POW’s time in the prison. Spend some time watching the propaganda videos that were used at the time to show how well they were treated. You’ll see them playing basketball in the courtyard, enjoying holiday meals, and receiving gifts upon their departure. We now know that those imprisoned in the “Hanoi Hilton” as they called it were severely tortured so the videos are almost laughable. The prison is most definitely worth a visit but may be difficult for small children to see and comprehend. 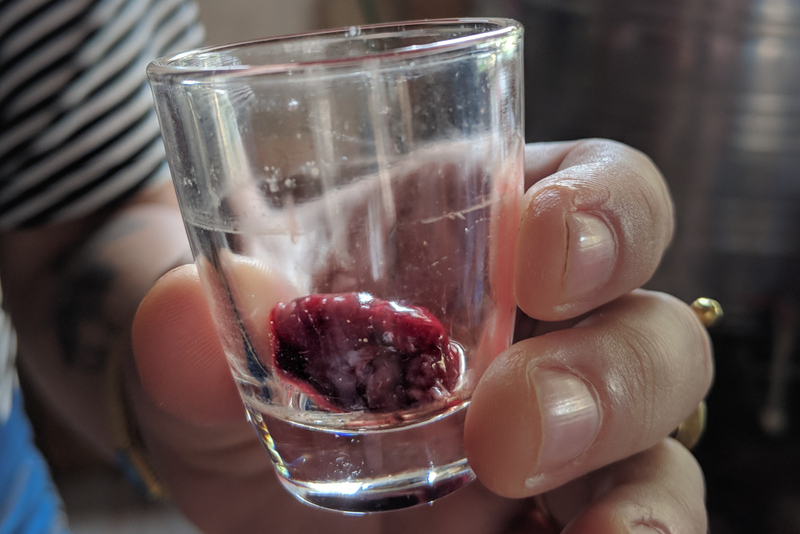 Bia hơi (beer hoi) is a Vietnamese beer that is brewed and delivered to various bars daily And because of its brief fermentation period, the final product is only about 3% alcohol. So it is a refreshing, easy-to-drink lager that is extremely cheap! A pint will run you about 13,000 VND (~.50 USD), about half of what you’ll pay for a can of Bia Hanoi. Beer hoi used to flow in abundance on “beer corner” on Tạ Hiện street in the old quarter. Unfortunately now these bars have moved to serving only the classic (and more expensive) domestic brews and some pricey craft beers. It’s worth spending an evening or two drinking at one of the many bars on “beer corner” anyway because it’s one of the liveliest spots in the city! 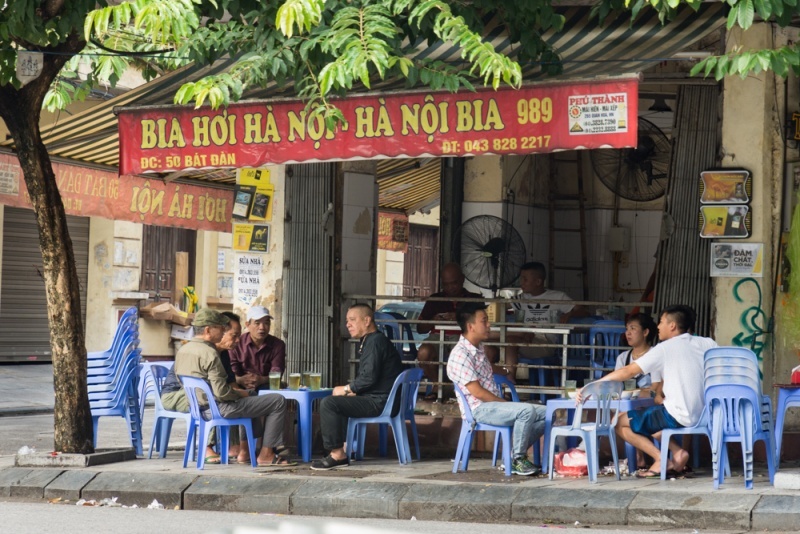 Keep your eye out for the Bia hơi signs at street-side bars around the city. The bars are generally quite simple – a few plastic tables set out on the street and a lot of drunk Vietnamese men. As you gaze upon the massive St. Joseph’s Cathedral, you may feel quite certain that you’ve seen it before. That’s probably because the double bell tower style is similar to the Notre Dame in Paris. 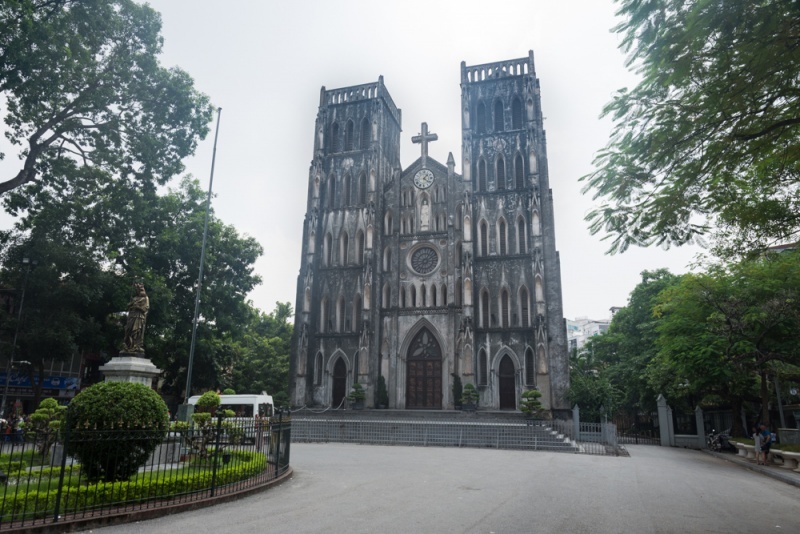 Construction of the cathedral began in 1886, making it the oldest church in Hanoi. Mass is conducted at St. Joseph’s several times throughout the day and on Sunday evenings at 6:00pm it can get so crowded that people spill out onto the streets. Visitors can enter for free but the cathedral opening hours can vary by day and it is often closed for lunch around the noon hour. This is not your typical puppet show. Dating back to the 11th century, these performances originated from puppet shows performed by villagers in waist-deep water when the rice paddy fields were flooded. The location has changed but the traditions remain the same. These beautiful puppets are accompanied by an orchestra and folk tale storytelling to enthrall guests of all ages. Thang Long Water Puppet Theater is the most popular place to watch a show in Hanoi. There are 5 daily shows at 3:00pm, 4:10pm, 5:20pm, 6:30pm, and 8:00pm. Tickets cost 100,000 VND/person. There are so many delicious restaurant options around Hanoi, it can be difficult to decide which one to choose. But there is one place in particular that you cannot miss – Bún Chả Hương Liên. Not only do they serve arguably the best bun cha in the city, but Barack Obama and Anthony Bourdain ate here together during a visit to Hanoi in 2016. The second floor table where they dined is now enshrined in plastic and proudly displays a photo of the two of them dining together. For only 85,000 VND (~$3.50), you can try the “Obama Combo” which was his preference during his visit. It’s a huge helping of bun cha and an ice cold Hanoi beer. 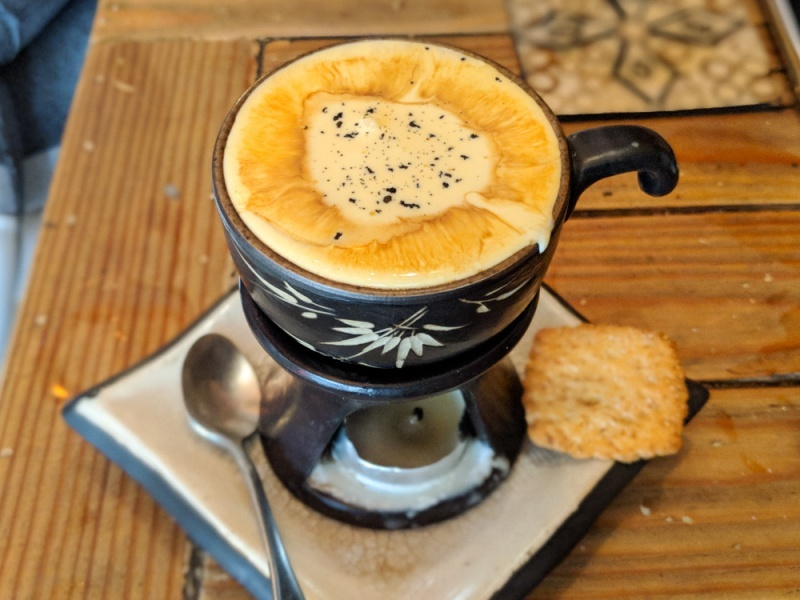 Egg coffee is another classic Vietnamese specialty to try in Hanoi. You can find it all over the country but it owes its origins to the north. Made from egg yolks, sugar, condensed milk, and coffee, this will probably be the most decadent cup of coffee you’ll ever have. 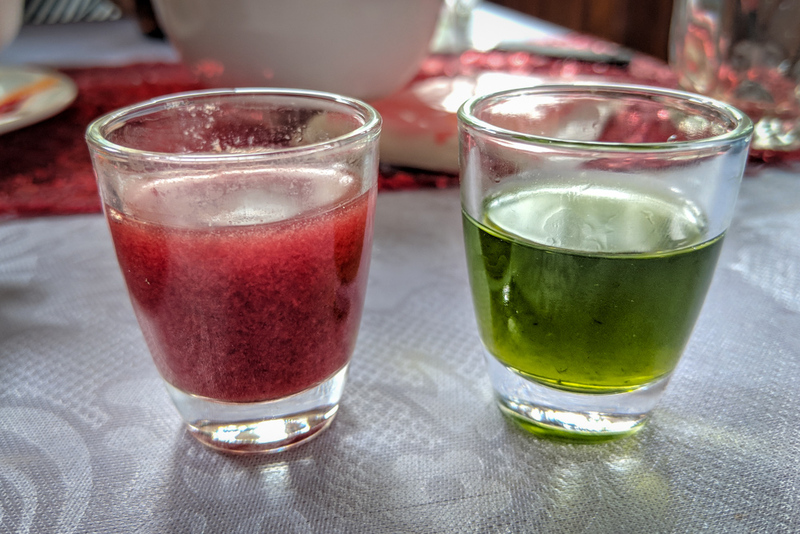 Enjoy a cup of it at the famous Giảng Cafe or, if you’re brave, opt for an “egg beer”. About 5 miles east of the center of the city is the perfect place to sample a local delicacy, snake. The locals that live in Le Mat snake village have been hunting and catching snakes for generations as they believe it should be eaten by men to increase their strength and virility. The area is now filled with restaurants catering to both locals and foreigners. 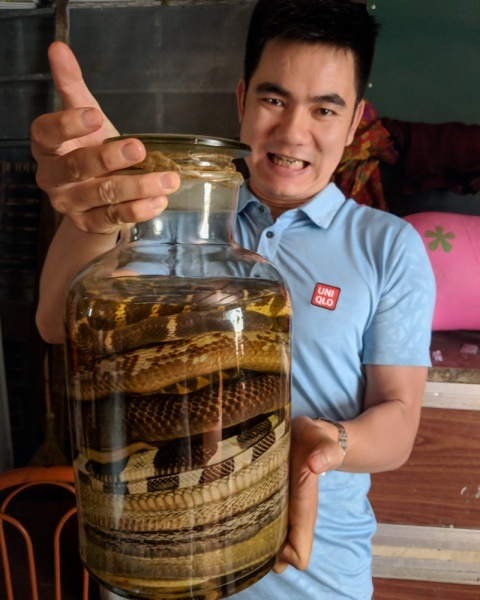 Our restaurant of choice was The Hung Snake Restaurant, owned by a hilariously entertaining man named Dragon whose motto is “happiness first, money second”. You’ll start your meal (well, it’s really more of an experience) by selecting the type of snake that you’d like to eat. You can choose to view the killing and cooking experience if you’d like, or just wait at your table if you’d rather not. They will present the live snake to you, and then swiftly whip the snake on the ground to kill it. 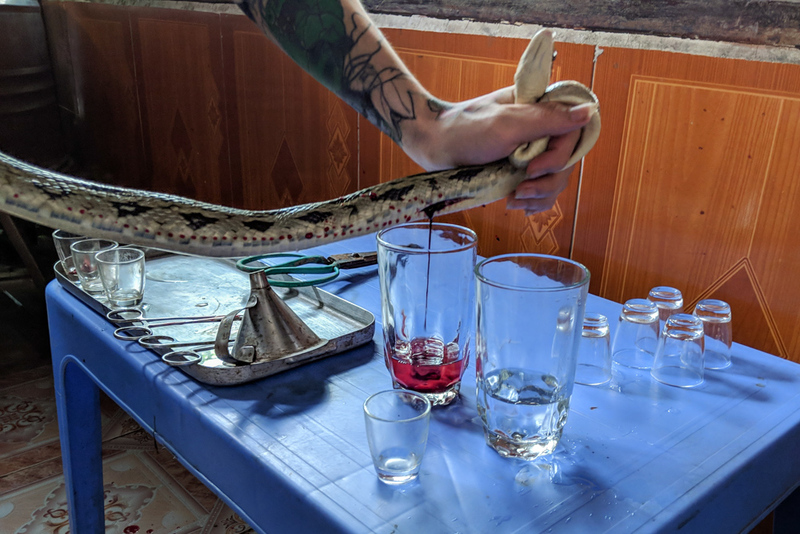 They’ll then remove the heart and drain the blood – both of which will be mixed with rice wine for you to enjoy. 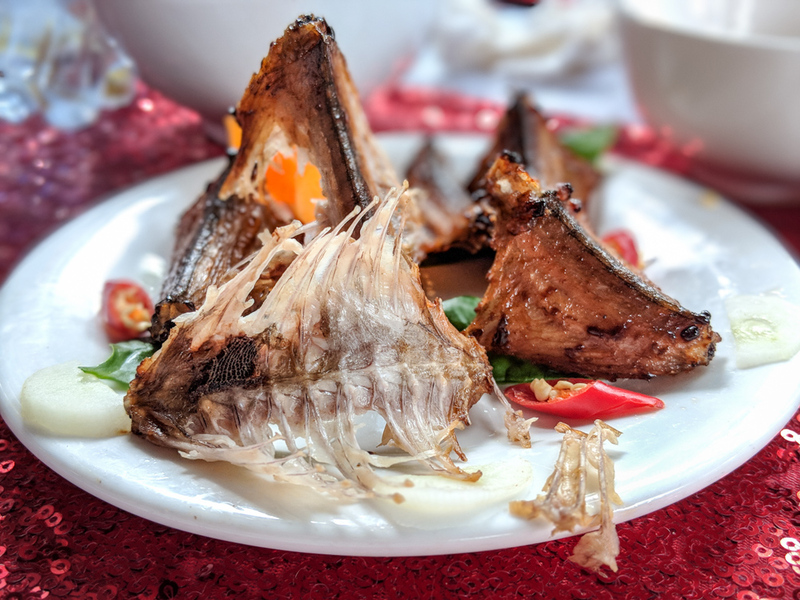 And finally you’ll be served an enormous meal of snake egg soup, grilled snake, snake spring rolls, sauteed snake meat, fried snake bones, crispy snake skin, sticky rice steamed in snake fat, and snake porridge, just to name a few of the dishes. Snake is actually really tasty – it’s lean and tastes a bit like chicken. 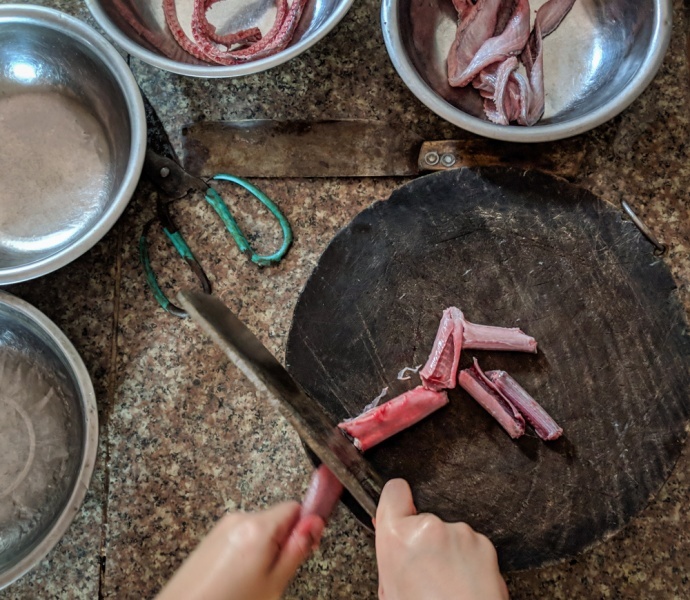 Read everything you need to know before eating snake in Le Mat here! 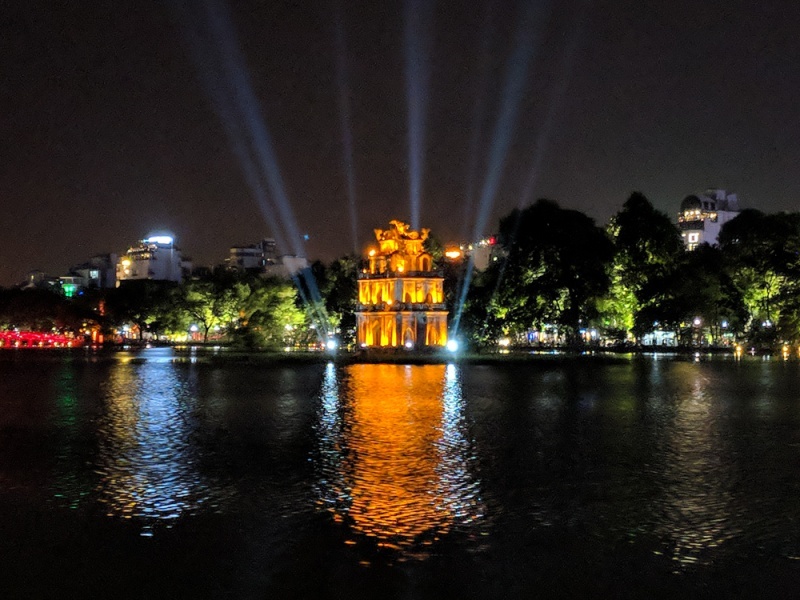 Hoàn Kiếm Lake seems to be the “social heart” of Hanoi. Tourists love to visit the beautiful Ngoc Son Temple, locals love to join exercise classes on it’s banks, and children love zooming by on their tiny motorized cars. It’s a relaxing place to go for an afternoon stroll or an early morning jog as it feels a bit removed from the hectic city. The streets are closed to car traffic on Saturdays and Sundays making it an even more enjoyable place to spend an afternoon. Stop and try an egg coffee at Cafe Đinh on the north end of the lake – it’s some of the best in the city! The Old Quarter of Hanoi is a hub for tourists as it is packed with hotels, shops, bars, and restaurants. Even if you don’t stay in the Old Quarter, you’ll find that you end up there regularly. Be sure to have a look up while wandering around. It can be difficult as you’ll be avoiding the motorbikes filling the sidewalks, but the old, colonial-style buildings are quite charming. The shop-houses are very narrow and long (to avoid paying a high tax rate) and generally have a small shop in front with multiple families residing in the rest of the space. 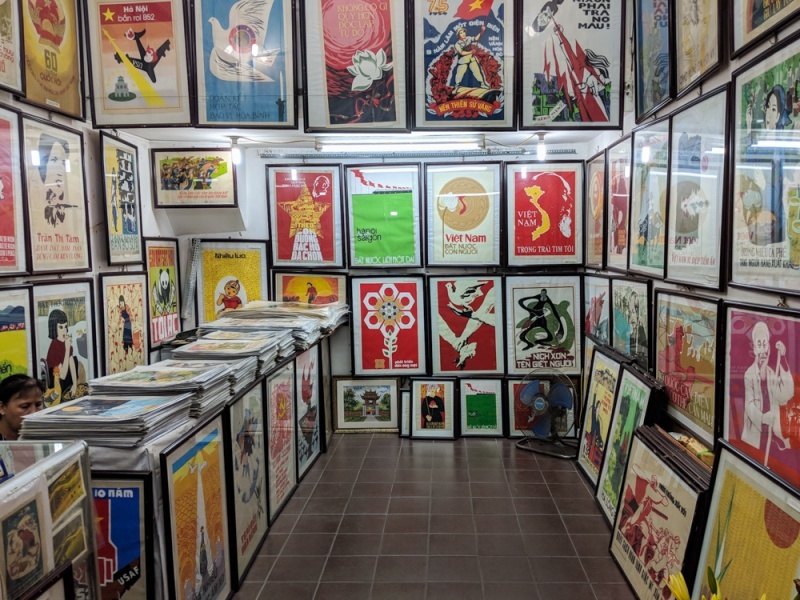 The Old Quarter is a great place to pick up souvenirs for friends and family members back home during your trip to Hanoi. 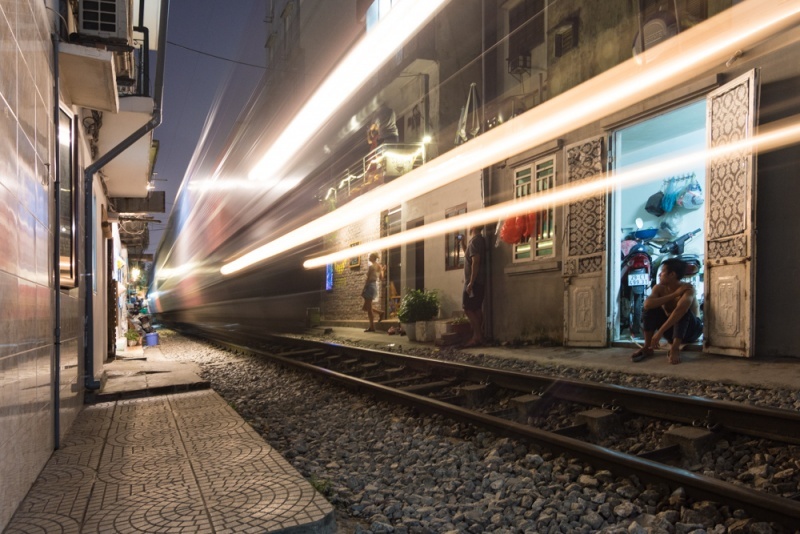 While visiting the Old Quarter of Hanoi, be sure to check out the train tracks, or the “Hanoi Train Street” as it is popularly called. This narrow stretch of alleyway is full of people going about their daily life – laundry is drying, children playing, and small shops selling goods are open for business. Then a few times a day the train passes, seemingly so close to both the people and the buildings, and the locals seem completely unphased. 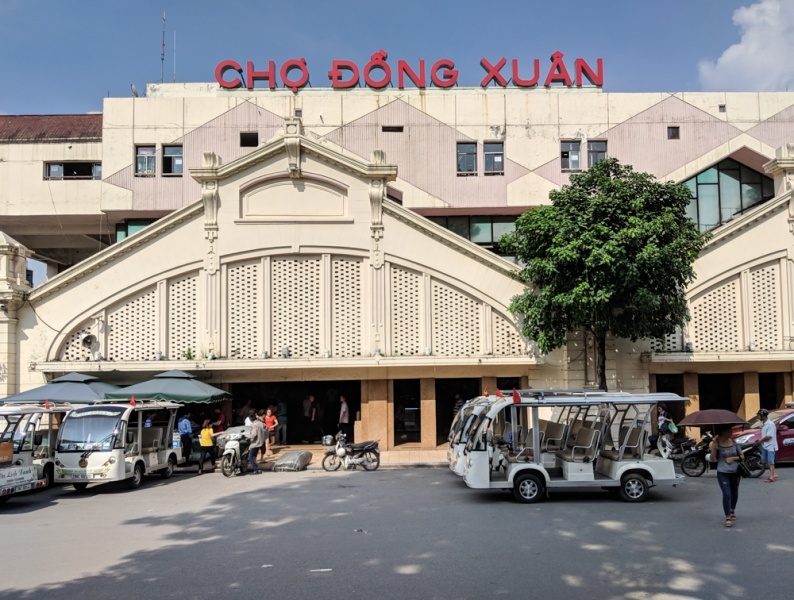 Wander along the tracks and then stop for a coffee or a beer at the Dau Ma, along the stretch of railway between Tong Duy Tan and Pho Ton That Thiep streets. They have seating inside or a nice rooftop space just across the tracks. The Dong Xuan Market has 4 stories of treasures and is Hanoi’s largest indoor market. And it doesn’t cater specifically to tourists. Vendors are selling everything from fresh produce to household appliances to clothing and everything in between. Tourists will love exploring the countless stalls on the lower level filled with reasonably priced souvenirs and knock-off shoes and purses. The second floor is filled with miles and miles of fabric of every texture and color. It’s the ideal place to buy fabric to get something custom made by one of the many tailors in town. 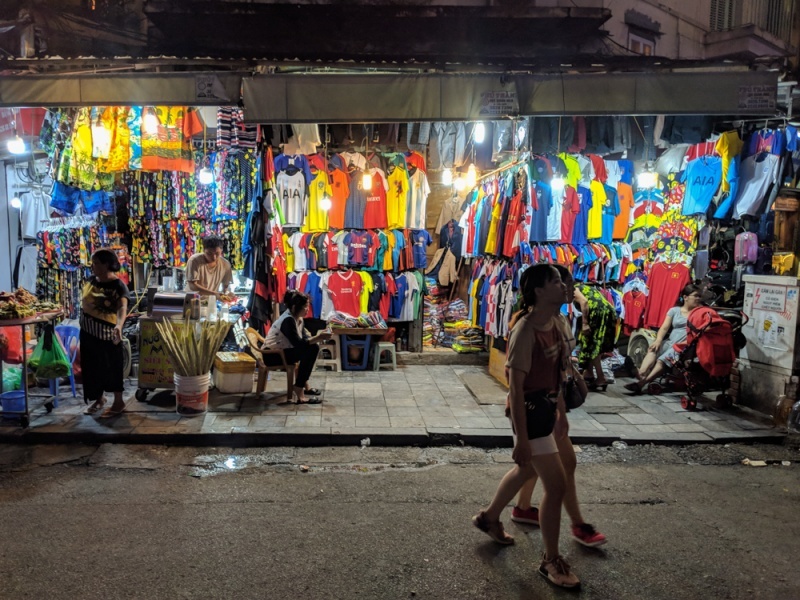 While Hoi An is considered the most popular town in Vietnam to get something tailored, Hanoi may be the cheapest. Jade Tailor is a small shop down an alleyway just a short drive from the old quarter. The owner can speak English and is super responsive via Facebook messages. She has a few fabric options available in the shop, or you can head to Dong Xuan Market for a plethora of options. 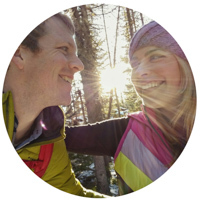 Plan on waiting about a week for your custom creation to be complete. 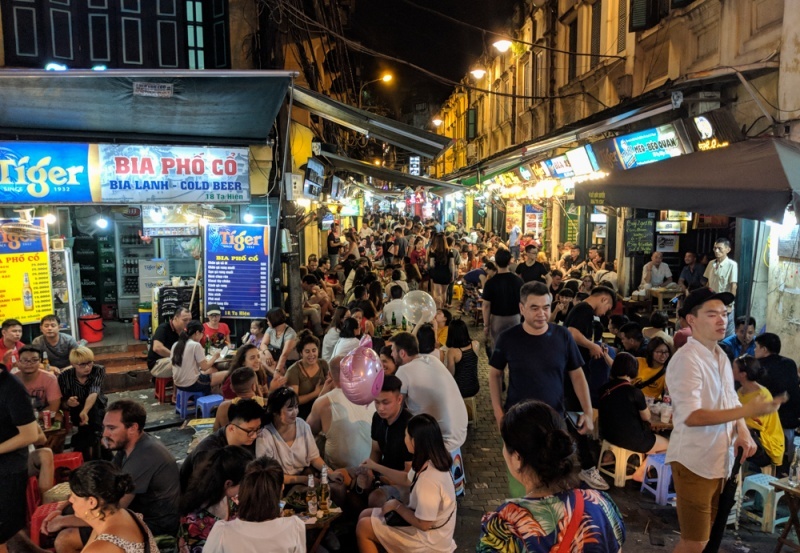 The Hanoi weekend night market is held every Friday, Saturday, and Sunday night from 6:00pm until about 11:00pm. It runs from Hang Dao Street to Dong Xuan Market and is almost 2 miles in length. Here you’ll find stalls offering everything from knock-off handbags, clothing for both men and women, souvenirs, electronics, food, and everything in between. It’s a popular place for both locals and foreigners to wander around, browsing the goods. Ho Chi Minh was a beloved leader of Vietnam and is known by the locals as “Uncle Ho”. He was very active in politics in Vietnam – he was a Vietnamese Communist revolutionary leader, a Prime Minister, and was President of the Democratic Republic of Vietnam (North Vietnam) until his death in 1969. Communist forces seized control of Saigon in 1975 and renamed the city Ho Chi Minh City in his honor. Uncle Ho’s request was to be cremated upon his death but against his wishes, his body was embalmed and a marble mausoleum was erected to house his body. 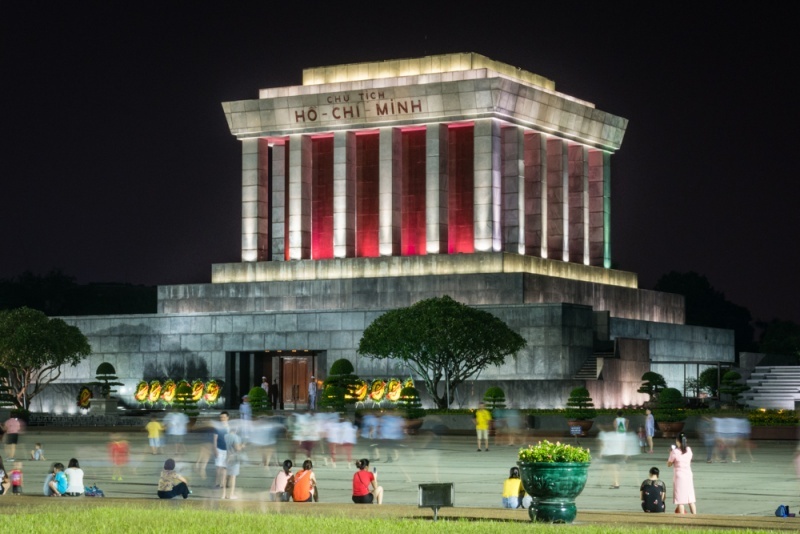 Visitors may visit the mausoleum to pay tribute to the man who was so influential in shaping Vietnam’s future. During your visit, be sure to dress modestly – shorts, tank tops, and hats are not permitted. You may be requested to store your belongings before you enter and photography is strictly prohibited once inside. Go early if you want to avoid waiting in line. The mausoleum generally closes from September 4th to November 4th while his embalmed body undergoes maintenance. Halong Bay is located about 110 miles east of Hanoi (3 hours by car), and is arguably one of the most popular tourist destinations in Vietnam. Most tourists visit Halong Bay for just one night but we would recommend spending at least two in this beautiful region of the country. 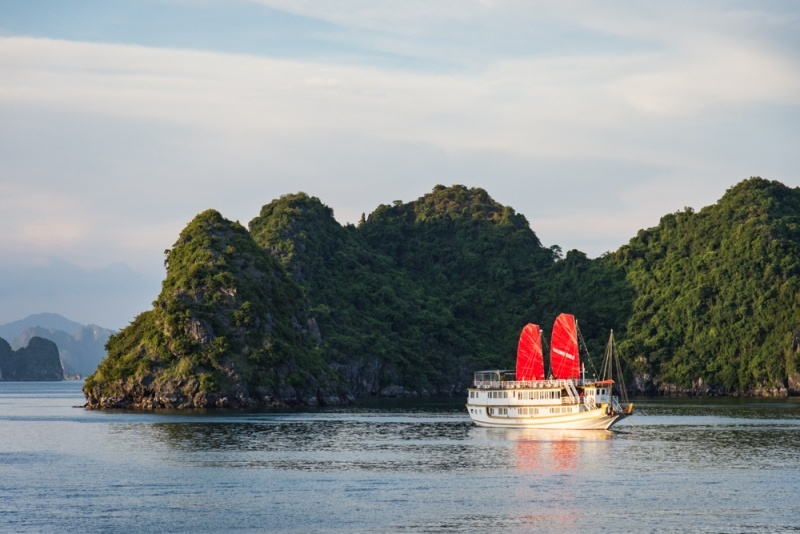 Read all about how to select the best Halong Bay cruise here! 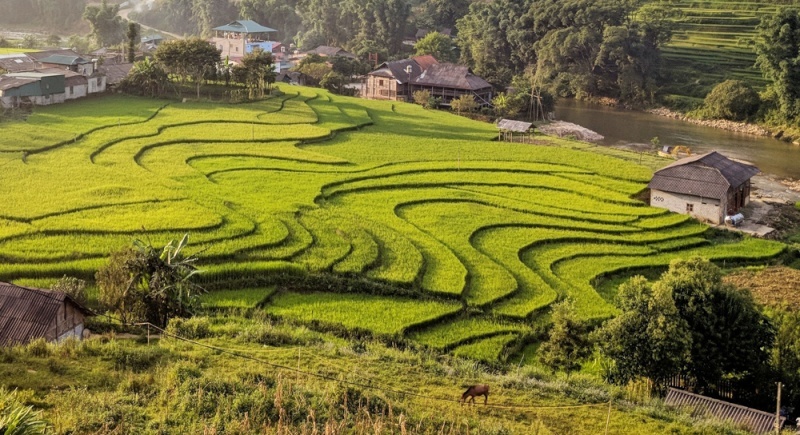 Probably the second most popular tourist activity in Vietnam is to go trekking through the Lao Cai region (known more commonly as Sapa), about 200 miles north of Hanoi. And for good reason. Northern Vietnam is strikingly beautiful and remote with terraced rice paddies as far as the eye can see and local tribal people going about their daily chores in traditional attire. As tourism has increased over the years, so has the infrastructure of the area. The town of Sapa is now filled with hotels, shops, restaurants, and bars. You’ll also find that you are frequently hassled by Hmong women wearing thick jackets colored from indigo who want you to purchase their wares. Tourists looking for a more authentic experience generally prefer to stay in Tả Van, a 45 minute taxi ride from Sapa (which will cost about 200,000 VND for 2 people or 250,000 VND for 4). Keep in mind that the road may be impassable if there have been heavy rains. There is no need to book a tour in Hanoi. You will be surrounded by Hmong women offering you their tour guiding services as soon as you get off the bus. Or you can contact our good friend A Hang Thi via Facebook directly. She grew up in a Hmong village, speaks perfect English, and is hilariously entertaining! Getting There: From Hanoi you can take a bus or hire a driver to Sapa. The Sapa Express bus is the most popular as it is comfortable and generally leaves on time. You can choose the 7:00am bus with seats or the later times that offer beds. We found the seated option to be far more comfortable than the beds, especially for people who are tall or who have mobility issues. 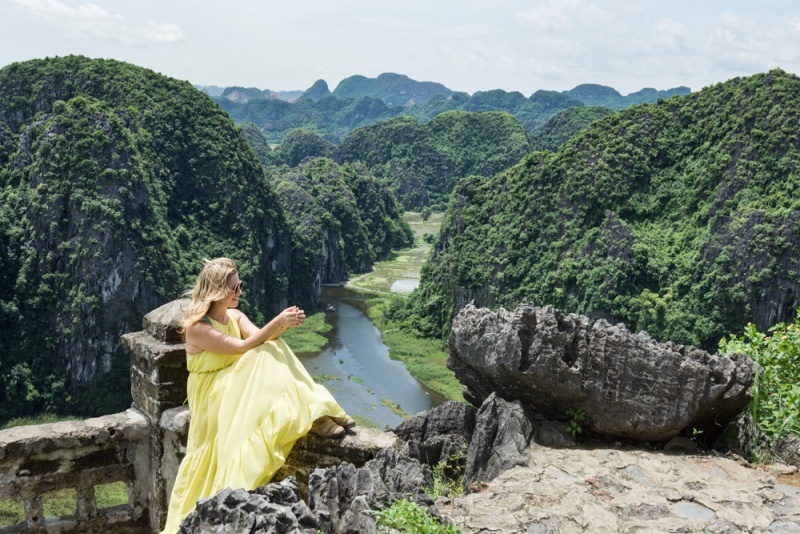 The Ninh Binh region is a gorgeous area filled with towering limestone pillars and lush green rice paddies about 60 miles south of Hanoi. You can do this as a day trip if you’re short on time or spend a few nights in a bungalow and take your time exploring the area. The most popular activity is to take a relaxing boat ride through several underwater caves. You’ll love getting lost on the quiet back roads on your motorbike in this tranquil, remote paradise. Read all about planning a trip to Ninh Binh and Tom Coc here!